Eric Roy's company, Hydroviv, has 8 employees nicknamed 'water nerds,' and it's looking to grow. Eric Roy founded Hydroviv in his Washington, D.C., studio apartment, designing water filters capable of handling Flint, Michigan’s high lead levels and sending them to the community for free during the height of its crisis. Today, the company has eight employees nicknamed “water nerds.” Roy is eager to grow — and that’s where the Sharks come in. 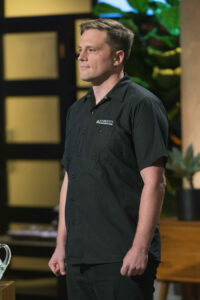 The 37-year-old Lisbon native will be on ABC’s “Shark Tank” on Sunday. After graduating from Lisbon High School in 2000, Roy studied chemistry at Colby College then pursued a doctorate at the University of Maine. He moved to Washington, D.C., about four years ago and watched the water contamination news in Flint from afar. “I was able to build some prototype cartridges, get them tested, and once they were validated, I was able to go to a contract manufacturer to actually have them produced,” Roy said. He sent more than 1,000 filters for free to Flint, and, over the next two years, shifted the venture to a business specializing in building filters specific to costumers’ own water sources. 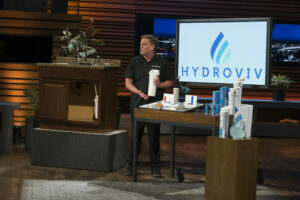 Roy emailed the “Shark Tank” show last year with the twin goals of raising water quality awareness and expanding Hydroviv’s visibility. “For a consumer product, ‘Shark Tank’ just has this reach that you can’t do anywhere else, so it’s like you’ve got to try,” he said. The episode with him and Hydroviv airs Sunday at 10 p.m. on ABC. He’s heard through his parents, George and Judy Roy, that “Lisbon is buzzing” about the upcoming appearance. He’s sworn to secrecy about the outcome, but he said it was a great, if crazy, experience.